AUTHOR’S NOTE: An oldie from my archives–this article appeared in the 1990s, in a magazine that no longer exists. My calypso career as “Lady Complainer” began in 1984 and continued until 1986. Ah what nights! Singing my calypso number, sandwiched in the bill between a Chinese Trinidadian guy (who was hired as a comedy act because he sang off key and completely out of rhythm), and a pair of singing midgets. Our little group of calypsonians sang all around the island, setting up stage in empty lots, in an old movie house in Chaguanas (the town where VS Naipaul was born), and in the middle of cricket patches, and in the cane fields. I remember the smell of burning sugar and sweat, of home brew rum and Florida water cologne. I do not think I have ever felt so electric and alive as I did standing before the most demanding audiences in the world. I grabbed the bottle by the neck, opened it, took a sniff and nearly fell down. Tipping back my head, I took a good long gulp of calypso’s nectar–whatever it was, I figured I was going to need it. In a few minutes, I was going out on stage to make my debut as Lady Complainer, the first American ever to appear on the stage of a calypso tent in Trinidad. Calypso–equal parts poetry, rhythm, and lively daily newspaper, is the national music of twin-island country Trinidad and Tobago (and is popular throughout the rest of the English-speaking Caribbean). In four well-honed verses and choruses, calypso delivers comments on current topics in a spicy Trinidad patois spiked with double-entendre. Some calypsoes are serious and controversial criticisms of politics, government and history. Others spin bawdy, pun-filled tales about women, men, and the intricacies of Caribbean family life. In the Caribbean, you can hear calypso throughout the year, but the main time for the music is in January and February, the buildup to the Calypso Monarch competition that’s held on Dimanche Gras, the Sunday before Trinidad Carnival. The calypso season opens about six weeks before Dimanche Gras in calypso “tents”, or venues, scattered about the capital city of Port of Spain. About six tents open each year. Mine, the Shadow’s Master’s Den Calypso tent, was noisy, crowded and dusty, with the atmosphere of a travelling circus. Though its name conjures up visions of an exotic, smoky nightclub, Shadow’s Master’s Den was–like most of the other tents–an empty lot in downtown Port-of-Spain. For most of the year, the space functioned as a trade union hall and chicken roost. We calypso singers shared our outdoor dressing room with a gang of well-wishers, journalists, hangers-on, mangy dogs and irritable chickens. Several weeks before, the lot had undergone a Cinderella-like transformation. A crew had constructed a rickety wooden stage and canvas backdrop, set up a few hundred folding chairs, a gate, and attempted (unsuccessfully) to evict the resident fowl. Then, food vendors came, erected makeshift kiosks. Savvy neighborhood kids materialized with bottles of rum and buckets of beer on ice (for sale at twice the market rate). Now, this all-but-abandoned yard was the “Master’s Den”, a hub of cultural activity, a Trindadian version of Madison Square Garden, Broadway, and the Ringling Brothers circus rolled into one. Every breath was a swirl of smells: roasting corn, sizzling barbecued chicken, hot peanuts, rooster dung. Over in one corner, Calypso Rose, the stately queen of calypso (and one of its few women), perched regally on a rusty folding chair, dressed in a gown covered with sequins that sparkled like diamonds in the dust. The house out front was packed on this opening night; we couldn’t see the crowd, but we could certainly hear them hooting and cheering and whooping. Calypso, like an old vaudeville show, depends on vigorous (sometimes aggressive) audience participation. One by one, the calypsonians would go out on stage to present their new songs, songs they’d been preparing all year (each singer gets to sing one number, with a total of about 25 singers to each tent). One by one, they’d return from the lion’s den, some of them beaming like heroes of war, sweaty and ecstatic from the applause, the encores, the shouts of kaiso! (Trinidadian for “Well done!”). But just as often, they’d exit the stage to a rain of orange peels and toilet paper rolls. “Trinidadians ain’t easy,” these unfortunates would shake their heads and mutter. And the backstage contingent would nod sympathetically. Every calypsonian knows that the calypso world is fickle. For every season of kudos, there are three of toilet tissue. And I was up next. I took another swig of Cro Cro’s rocket fuel for confidence and started to jump and dance to get my energy up, the way I’d observed my fellow calypsonians do before they burst out on stage. Dressed in my neon-colored tights and sequined shoes and top, I knew I looked the part of a calypso up-and-comer–at least until you got to the pale face and the blond head. Now called “calypso”–the origin of the word is a subject of heated debate–the music assumed its own special place within the carnival celebration. But for generations during the colonial era, calypso was considered rough and declasse, and was shunned by the island’s light-skinned rulers and society elite. 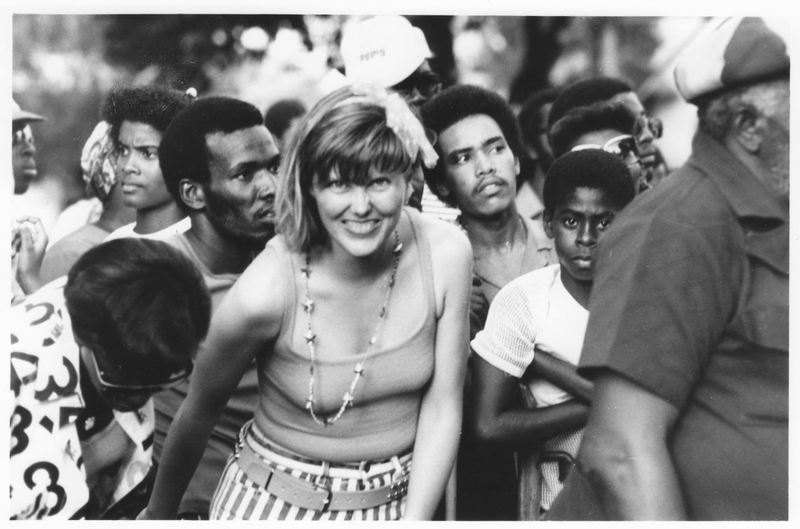 Calypsonians themselves were stigmatized as riffraff and gangsters, and “nice” people stayed away from the tents. Today, twenty or more years after independence, these prejudices still held sway for a lot of Trinidadians, even those of African origin. Though calypso is historically a subversive art form where almost anything goes (example: a calypsonian will sometimes sing an anti-government calypso directly to the Prime Minister sitting in the front row), a white person stepping into the calypso arena was guaranteed to cause an uproar. But what kind of uproar–a pelting of orange peels, or a thunder of “kaiso!”? Soon, I’d find out. However, as I jumped around backstage, “making my blood hot” as one of my calypsonian pals put it, I wasn’t thinking about controversy. Instead, I recited the words of my calypso over and over again, practicing the all-important nuances of inflection, of timing, trying to feel the rhythm in every line. Calypso is a music that doesn’t require a dulcet-toned voice (although it doesn’t hurt to have one, as calypso’s worldwide ambassador, the Mighty Sparrow, has proven. )It’s a percussive songform; the earliest calypsonians perfected the technique of using words like the rapping of a drum. There were other things I had to remember: not to sing over the horn choruses, to enter on the correct beat, to belt out the punchlines at the end of every verse. Right next to the Master’s Den loomed the high yellow walls of the Port of Spain jail. The inmates inside, convicted murderers, rapists and bandits, could hear everything that went on in the Master’s Den, though of course they couldn’t see the performers. It was said that the Death Row inmates were avid calypso connoisseurs. My dream was to go down like thunder with this captive–and color blind–audience. The tent orchestra, fifteen musicians strong, struck up the opening chords of my song. Through a haze of nerves and excitement, I could hear the emcee, Stalk St. Hill, roaring out my calypso name (it’s calypso tradition to take an alias), that had been bestowed on me like a badge of courage by the tent manager: Lady Complainer. The crowd applauded politely, then drew silent. For an instant, I hesitated. Then, Cro Cro’s nectar kicked in, and I danced out to face the music. Calypso? This music didn’t sound at all like the Belafonte records I remembered, nor did it resemble the jazzy, big-band swing of the 1960s albums I owned by the most famous Trinidadian calypso singer of all time, the Mighty Sparrow. At Rhyner’s Records, in downtown Port of Spain, the clerk explained that this calypso was arranged in a new style that musicians had dubbed “soca.” Produced in modern, multi-track studios, with an emphasis on the bass line, soca was the latest thing, a calypso that could hold its own in the tents, as well as in the discos. I bought an armload of these albums, and took them back home with me to Brooklyn, New York. When I unpacked them, I noticed to my surprise that the jacket of every record bore the words: “Made and Recorded in Brooklyn,” with the address of a place called Charlie’s Calypso City, in the Bedford-Stuyvesant neighborhood. The venerable Lord Kitchener, a self-taught composing genius whose dazzling calypso melodies have dominated the repertoire of the steel bands from the fifties to today, breezed in, talking excitedly in his trademark stutter. These old-timers would bump up against sharp-tongued politicial critics of the new generation like Black Stalin, a Rastafarian whose dreadlocks dangled down the middle of his back. 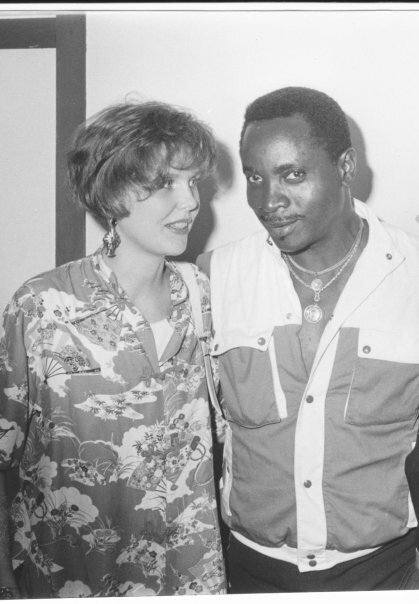 Whenever I had a chance, I’d slip into Charlie’s studio unobtrusively, listening carefully as the hits, and the missses, of each calypso season were assembled, track by track. It was like going to calypso college. In the multi-track studio you could listen to the layers of percussion instruments one at a time. Broken down piece by piece, it was easy to hear and understand the complicated rhythmic interplay between bass, guitar, drums and “iron”, congas and scrapers (a hand-held cheese grater-like device). The best records were able to combine a punchy street-dancing rhythm with a catchy sing-along chorus. These were the tunes that would be sung in the tents, then played over and over in every corner of Trinidad come carnival season. I’d sit quietly for hours, listening to the rasp of voices over the saw of the guitar. The music made next door in Charlie’s modern studio was the polished, finished product. But the music I learned to love–and to sing–in this tatty apartment filled with the aromas of fish broth and rum was the real calypso, the link that connected the carefully crafted soca records to the chantwells of a century ago. borrowed the structure and techniques of modern pop songs; he’s acheived worldwide success, his records are distributed by Warner Brothers, and his music graces Hollywood soundtracks. Most importantly, calypso has opened up its doors to the whole of Trinidad, not just to Trinidadians of African descent. 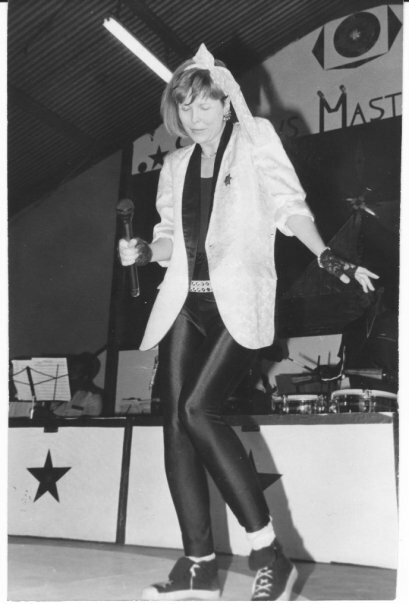 One of the biggest stars of the music today is Denyse Plummer, a white Trinidadian whose powerful voice and flamboyant stage performances have won her the title of “Calypso Queen” for three years running. “Chutney,” a type of soca with strong East Indian rhythms added, has become a popular element of every calypso season, and the top chutney singer, Drupatee, sings in the tents, as do Trinidadians of Syrian, Chinese, and European descent. endless weeks of the season. Pay is low, corruption rampant, and only a handful of calypsonians can make a living by singing; most have day jobs. (Four-time monarch, Chalkdust, is a schoolteacher). “You have to love calypso to sing calypso,” my mentor Shadow often told me. How right he was. After two exhilarating months on the calypso circuit, I had a scrapbook full of wonderful reviews, a life’s worth of heartwarming memories, an island-full of friends, and an empty bank account. It had been worth it; the thrill of performing for a rowdy, cheering Trinidad calypso audience is something no amount of money can buy. But I couldn’t afford to do it again. All of my calypsonian buddies had warned me that calypso gets into your blood. It was true. For a few years I could hardly bear to think about going down to Trinidad for the season–how terrible it would feel, having once been part of the calypso team, to have to watch from the sidelines! So I stayed home in Brooklyn, listened to the soca on the local West Indian radio station. After carnival, my old calypso cohorts would pass through town and tell me, kindly, that “You ain’t miss nothing. Was a slow season for calypso.” I’d nod, knowing they were fibbing me. At the post-coup Dimanche Gras 1991 Calypso Monarch competition, seven tense calypsonians paced the dusty backstage field of the Queen’s Park Savannah, a racetrack arena that holds 20,000 people. This year’s competition, the most hotly contested in recent memory, had been more than a simple battle of calypso giants. Most of the songs of 1991, as predicted, had been about the coup–how did it start, what would its aftermath be, and where did Trinidadians go from here? Calypso, this year, had been doing what it does best, raising issues, uncovering hidden emotions, serving as a musical escape hatch for social tensions and political pressure. In an hour or so, after two rounds of performances, a panel of judges would decide which calypsonian had tapped the public’s deepest vein. I stood off to the side, listening to the loud, rat-tat-tat calypso backstage gossip, feeling more than a little lost. Then a very familiar figure strode over to me, face wide in a cocky grin: Cro Cro. The impish, practical joker I’d met in the Master’s Den had gone on to become a two-time Calypso Monarch; he was defending his title tonight. I mumbled something about retiring from the business. He handed me an unmarked bottle. Calypso nectar, of course. This time, I knew exactly what to do.